Acclaimed duo Shovels & Rope has announced the April 12th release of their new album, By Blood on Dualtone Music. 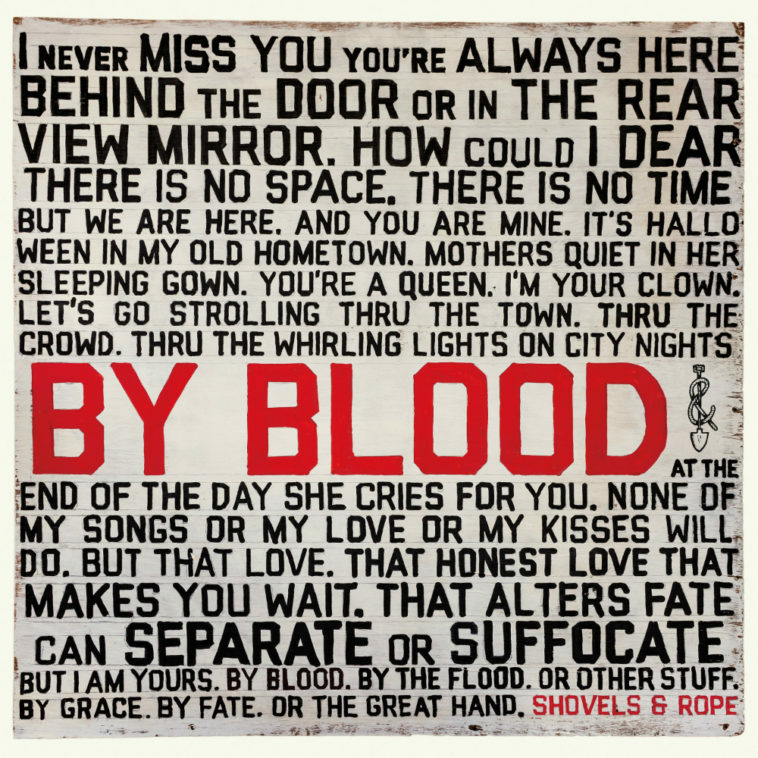 Known for their honest, literate, and narrative-driven songwriting, Cary Ann Hearst and Michael Trent (aka Shovels & Rope) inject raw and fiercely passionate emotion into the 10 new tracks on By Blood. The husband and wife team just released the biting, personal track “The Wire” (Listen Now). As with their previous work, By Blood was produced by Michael Trent and recorded at their in-home studio, recently upgraded to a new structure in their backyard. Outside of fiddle on one track (“Hammer”) and horns on another (“Twisted Sisters”), all instruments and vocals were performed by Hearst & Trent. By Blood is the follow up to the group’s 2016 album Little Seeds, which garnered critical praise, including The New York Times, NPR, Entertainment Weekly, Wired, Paste, Noisey, Relix and much more (View Highlights). In an ever-changing music business and media landscape, Shovels & Rope continue to evolve, exploring new ways to express their creativity while maintaining the highest levels of integrity. Along with By Blood, 2019 will see the release of an illustrated children’s book based on the “C’mon Utah” story, as well their film “Shovels & Rope: The Movie”, turning the concert film format on its head. 2019 also marks the third year of Hearst & Trent’s highly anticipated High Water Festival on April 13th & 14th in their hometown of Charleston, SC (following the By Blood release). Curated by the duo, the intimate 10,000 capacity music and culinary event sold-out its first two years well in advance. The 2017 and 2018 lineups featured a select range of acclaimed artists, including The Shins, Brandi Carlile, Jeff Tweedy, Jason Isbell & The 400 Unit, Dawes, Nathaniel Rateliff & the Night Sweats, Band Of Horses, Lucius, Deer Tick, Julien Baker and many more. To view this year’s incredible line up, go to https://highwaterfest.com/. Shovels & Rope have built a reputation as boldly honest, heart-on-sleeve artists who put everything into their craft and their incendiary live performances. 10 years in, Cary Ann Hearst and Michael Trent are on the brink of having their second child, and their little family band and business show no signs of slowing down. The release By Blood just affirms that we are all the better for it.